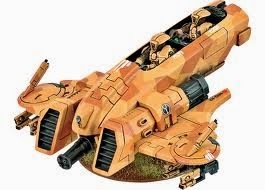 As requested, the next Tactica article will be the Piranha Light Skimmer. Piranhas were one of the biggest winners when the 6th edition codex was released, but a high dollar-to-point ratio keeps these guys from swarming the tables of casual gamers. A Piranha Light Skimmer team is between 1 and 5 Piranhas. Each Piranha carries a pair of Gun Drones and a Burst Cannon (which can be switched out for a Fusion Blaster) giving it the same damage output as a Devilfish. It is an open-topped, fast, skimmer that can take Tau vehicle upgrades but is often run bare-bones. Unlike other light skimmers, the Piranha has a front armour value (AV) of 11, and AV10 on the rear and sides, making it deceptively tough. All this comes at the incredibly low price of 40 points each. However, if you remove the cost of the detached Drones from the model (14 points each), you end up with a Burst cannon on an AV11/10/10 skimmer chassis for 12 points! That is a steal of a deal if I ever saw one. The Piranha can serve a few purposes on the field. It is an excellent vehicle that has unique uses, all while being a cheap point investment. Be warned, unlike most other Tau units, the Piranha is not a shooting powerhouse. As the name suggests, Piranhas can be deadly in numbers but aren't much more than a minor nuisance on their own. Drone Delivery. Dropping off the Drones should be one of the first things your Piranha does. Whether you are dropping them in your backfield as screens or in your opponent's area to harass, they need to get off before the Piranha(s) gets destroyed. These Gun Drones are factored into the cost of the Piranha, so it would be a waste not to demount them. Blocking. A fast skimmer can put itself almost anywhere on the board at a moment's notice. Piranhas are fairly large and are perfect expendable vehicles for blocking enemy advances. Objective Capping. With their turboboost, a Piranha can move 30" in a single turn. No objective is out of reach when you have Piranhas, and larger squads can actually tank shock enemy Troops far enough away from objectives to steal it from them too. Shooting Stuff. This is, ironically, going to be the last thing your Piranhas should think about. It is true that they are the cheapest way of getting a Fusion Blaster or Burst Cannon onto the board, and in squads of 3 they can put out respectable amounts of firepower. However, they are most useful while focusing on the first three roles. Most of the options available to Piranhas are not taken, simply because Piranhas are so cheap to begin with (who is going to pay 15 points to put a DPod on a 12 point vehicle?). Sensor Spines can be a good upgrade because it is cheap and gives Piranhas a greater degree of freedom when trying to block enemy units or get into cover in the enemy backfield. The Fusion Blaster is a good upgrade if your opponent takes vehicles. A single Piranha will not likely kill anything, but a squad of three is more dangerous. Your opponent will see that fast moving Fusion Blaster and will consider it a greater threat than it probably is. Some would argue that the 25% increase in cost is never worth it on the Piranha, and they may be right, but you are also paying for the perceived threat. Seeker Missiles are a situational option that players sometimes take. If you have markerlights to help fire them then they can be effective but, like most of the upgrades, are usually too expensive to put on such a fragile chassis. A Piranha team can vary in size, but should be run in squads of 2-4. Two is ok, but they lack punch and durability. Four is also ok, but their footprint is a bit large. Three is the sweet spot. It is enough models to put out respectable firepower, it isn't very expensive, it is not so huge that it is hard to find places to move them, it is large enough that it can block things effectively, and the squad can take a casualty before becoming basically useless. If you can field three, do it. Piranhas work very well with other Tau vehicles. The front AV11 renders them immune to most enemy small arms fire, and demands heavier firepower that is usually reserved for Devilfish or Hammerheads. Running them alongside heavier Tau skimmers will help keep them alive through target saturation. A Piranha's blocking uses are most noticeable when working alongside Tau infantry and Broadsides. Pathfinders, Fire Warriors, Kroot, Sniper Drone Teams, and Broadsides are all relatively slow elements in a Tau army. They need to stay put or move very little in order to keep up their damage output. The Piranhas block enemy advances, buying more time for these units before the enemy gets into assault. Here are some simple pointers on fielding your Piranhas. A Piranha is the perfect blocking vehicle. It is cheap, expendable, somewhat large, fast, and not entirely a pushover against enemy shooting. It can zoom around, screening your units, capping objectives, or blocking movement lanes for enemy tanks and infantry. THIS article on ATT goes into Positional Play in more depth. The basic idea, is that you move your Piranhas into positions that make movement and assaults difficult for your opponent. He cannot shoot before he moves, and so he must either try to go around (a long ways if it is three Piranhas) or he has to give up this turn's movement to shoot your Piranhas. If he assaults them, they are likely to die, but he will not get to consolidate after killing them, so they still served their purpose. The Piranhas will likely further slow him down as they become rough terrain. Nothing will drive your opponent crazy like 120 points of Piranha holding up 500 points of Land Raider+Scary Assault Unit for a turn or two. As a bonus, after detaching the Gun Drones, they can serve the same purpose. HERE is the section in the same article that describes using Drones for positional play. It is much of the same philosophy: screen your important units with cheap, mobile, expendable drones. Move Flat Out into enemy territory, getting hard cover if possible. If there is very little cover and your Piranhas are forced to Jink in order to stay alive, don't worry because they are still doing their job of attracting enemy attention. On your next turn, detach Gun Drones and move to attack enemies. Light vehicle rear armour, artillery crews, infantry on objectives, long range firepower units, etc. Note: the Drones are still effective even if the Piranha Jinked in your opponent's turn. A squad of three Piranhas can put out 12 S5 shots at BS3: not bad against AV10 vehicles. The 6 detached Gun Drones also put out 12 S5 shots, BS2 but twin-linked. The Drones can disembark, fire their carbines, and assault their target all in the same turn because they are considered as disembarking from an Open Topped vehicle (Piranhas ARE open topped, but this rule also goes for Drones mounted on other Tau vehicles). Unfortunately, Drones have a Strength of 3, so they won't be able to destroy vehicles in close combat, but they can easily tie up some Heavy Support infantry. Now your opponent has two separate units to get rid of, and that will draw heat away from your heavy hitters. The only real disadvantage to this tactic, is that your Piranhas will likely die early and will not be around to cap objectives, block enemy units, screen assaults, etc. Though the Piranha is not exceptional at it, it can be used to hunt vehicles. For this you will usually need a minimum of three piranhas. You can take Fusion Blasters, but Burst Cannons work just fine against most light vehicles' rear armour and Piranhas have a better chance of seeing that armour facing than our other vehicles. The gut reflex is to buy Fusion Blasters and put them as close to enemy heavy vehicles as possible (Land Raiders) but Piranhas really should be hunting weaker prey. Targeting enemy vehicles in your opponent's backfield is where Piranhas shine, and it is a cheap investment considering what your opponent will need to do to remove them. If you really want to go for those Fusion Blasters, they can be worth it, but keep in mind that adding a Fusion Blaster is over an 80% increase in the cost of the Piranha (25% increase of the total cost of Piranha+Drones). Piranhas can cause additional problems for transports, on top of the blocking or damaging. By positioning your Piranhas across the access points, any model disembarking must make an Emergency Disembark, which renders them completely useless for their turn. Even if you are unable to force an emergency disembark, you can force the passengers to disembark on the side of the vehicle that you want them to. A Piranha "Feeding Frenzy" is when Piranhas are able to completely surround an enemy transport vehicle, making it impossible for models to disembark, even by Emergency Disembark. Often, your Piranhas will need to coordinate with other units (like their own drones) to pull it off. When trying this, the objective is to wreck the vehicle, not Explode it. If it Explodes then the entire transported squad will be placed where the vehicle used to be, making your careful Feeding Frenzy placement a waste. Example: A Rhino, carrying 10 marines is moving up the field. You have 3 Piranhas within 9" of the left side of the Rhino. They disembark their drones 6" towards the nearest face and then move for the Rhino's other facings. The Piranhas move Flat out to position themselves <2" from the Front, Back, and Right facings. They must remain within 4" coherency, but they need to be <3" away from each other so that no 1" bases can fit between. The Drones run a minimum of 1" to be <2" from the left flank of the Rhino. This makes it impossible to place a space marine in contact with the hull without being less than 1" from the Piranhas or the Drones. See below. A unit of Deathrains fires on the Rhino and wrecks it. The 10 marines inside of the Rhino are automatically destroyed, because they cannot be legally placed before making their emergency disembark move. 150+ points of marines killed by 120 points of Piranha, and all the Piranhas had to do was be there. Note that all models must be legally placed before making their disembark move, so even if a few marines were able to disembark (due to bad run rolls or a very large vehicle size), the rest of the squad would perish. Granted: This is an idealized situation and may not happen very often, or ever. It is just intended to demonstrate the tactic. 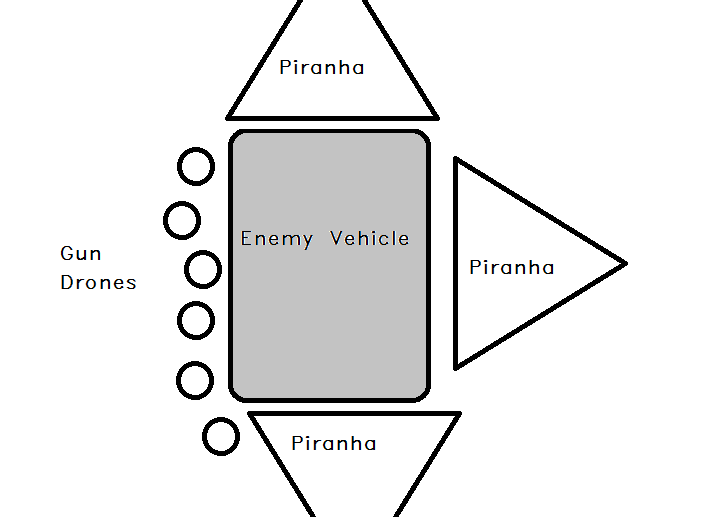 More often than not, your piranhas will not be able to completely surround a vehicle, but if you can at least block all of the access points, the transported unit will be forced to emergency disembark, which effectively takes that unit out of the game for a full turn. Sometimes you can even choose which side they must disembark from, forcing them into your army's field of fire. Though not as fancy as true Feeding Frenzy, it still provides you with tactical advantages. Piranhas are an amazing vehicle, especially considering they are dirt cheap. They are not a heavy-hitting powerhouse, but they bring several elements to your army that you cannot get anywhere else in the Tau codex. The blocking and screening potential from piranhas and their drones is fantastic, and can hold up enemy advances long enough for the rest of the Tau forces to pulverize them with long range firepower. When not blocking enemy units, piranhas and their drones make perfect backfield harass units or long range objective cappers. Many players field one or even two Piranhas (there is one in the starter set after all), but are unimpressed with the results and stop playing them. Adding the third Piranha can make a huge difference. The only major obstacle for players wanting to field lots of Piranhas, is the monetary investment. Paying $30 for 40 points is really expensive. However, assuming you can pick some up second-hand, or have the cash, a squad of 3 Piranhas will not disappoint if given the chance. Let us know what you think. Did we miss something? Do you use your Piranhas for other purposes? I have a total of four, but I only have two built right now. The only downside for me is a play against a decent amount of eldar. Wave serpents make a mockery of av10 vehicles like pirahnas. The s7 that ignores jinks just kill squadrons a turn. But in my other games, they perform as expected. I also use a remora drone for positional play, they compliment each other well. which almost always will be filled with pathfinders, and the third maybe a flyer. how ever if I do find a spot I take 2-3, for exactly the reasons you told me to. great article. @leon de pinda: I hadn't really considered that. Fast Attack really is a crowded slot in most Tau armies. I personally do not field Pathfinders or fliers, so the slot is often wide open for me.